being released on May 17…was a perfect 7-for-7 in stolen base attempts with the Stripers... Signed a minor league contract with the Mets on May 18, and finished the season with their Triple-A affiliate... Batted .254 with four double and four RBI with Triple-A Las Vegas...Finished the 2018 campaign with 11 stolen bases in 12 attempts. Hit triples in games three and four of the ALCS…Prior to game three had not recorded a triple since Aug. 13, 2014 vs.
PIT… He became the first player to triple in consecutive postseason games since Kazuo Matsui (COL) in GM 2 & 3 of the '07 NLDS vs. PHI…The last player to triple in consecutive LCS games was Scott Spezio (STL) in GM 2 & 3 of the '06 NLCS vs. NYM…Is the 2nd player in Blue Jays history with a triple in back-to-back playoff games, joining Devon White (Gm 3 & 4, 1993 WS)...Hit his first career postseason home run off of Yu Darvish in game two of the ALDS, Oct. 7 at TEX...His .303 average (10-33) in the 2016 playoffs was 2nd highest on the club behind Josh Donaldson (.417) and 4th among all MLB players...Recorded multiple hits in four of his nine games in the postseason…Entered the playoffs hitless in two career postseason at-bats...Hit his 5th home run of the year Sept. 12 vs. TB...Marked his 2nd career PH-HR (last: July 25, 2015 at SEA)…Became the first Blue Jay to hit a go-ahead PH-HR since Colby Rasmus on Sept. 4, 2014 vs. TB…Of his 10 career HR, this was the first one that had put his team ahead...Placed on the 15-day disabled list for the 1st time in his career (strained left achilles on Aug. 1)...Returned from a medical rehab assignment at Buffalo & activated from the 15-day DL on Aug. 16...Hit his 3rd HR of the season & 2nd over a 4-game span, June 18 at BAL…Had hit just 2HR over his previous 68 contests prior to that stretch...Set career-highs in games (110), runs (47), hits (67), 2B (9), HR (6), BB (27) and strikeouts (70)...Recorded a career-high four hits (4-for-5, 2B) & matched his career high with three runs scored April 23 vs. OAK. Had two separate stints with Toronto (May 2-Aug. 1) & Aug. 18 - end of season. • Set career highs in games (91), home runs (3), RBI (26), strikeouts (45) and average (.273). • On June 21 vs. BAL hit his 1st HR of the year and first since Sept. 13, 2012 at TEX...His 3 RBI in the game set a new single-game career-high. • Collected his first multi-RBI game since Sept. 23, 2012 on May 6 vs. NYY. • Recorded his first career pinch-hit home run July 25 at SEA. POST SEASON: • Made his second career postseason roster (last: 2014 with DET). • Appeared in two games during the playoffs, going 0-for-2. Spent the majority of the 2013 season with Triple A Columbus in the Cleveland Indians organization after being claimed off waivers from Philadelphia on May 2...Opened the season with Philadelphia -- appeared in 13 games, batting .077 (1x13) before being designated for assignment on April 30...Claimed off waivers by Cleveland on May 2 -- appeared in two games with the Indians before having his contract transferred to Columbus for the remainder of the season on May 7...Collected a season-high four hits on June 4 versus Toledo...Batted .197 (24x122) against lefthanded pitching...hit .269 (79x294) against righties...Hit .293 (56x191) with 39 runs scored, seven doubles, two triples, four home runs and 19 RBI in 53 games with Magallanes in the Venezuelan Winter League. Spent the first four months of the season at Triple-A Columbus and impressed the big league staff over his last two months in Cleveland after his August 3rd promotion (Johnny Damon DFA)...With the Clippers he hit .294 (116-394) with 65 runs scored, 19 doubles, 6 triples, 6 home runs, 42 RBI and 26 steals in 33 attempts (.345OB/.419SLG/.764OPS)....In the second half at Triple-A he hit .420 (37-88) with 21 runs, 8 2B, 3 3B, 2HR and 16RBI in 21 games, hitting safely in 20 straight games from July 12-30 and was named Player of the Week by the International League and Indians organization, July 23-29. At the time of his August 3rd promotion he ranked 2nd in the International League in runs (65), 3rd in hits (116) and steals (26), tied for 4th in triples (6) and 11th in batting average (.294)...At Triple-A he also hit .297 off left-handed pitching and .293 against right-handers...Scored 5 runs on June 5 vs. Buffalo, recorded 5 hits with 4 runs on July 25 vs. Toledo... Also had 9 multi-hit games over a 10-game stretch from July 19-28. With Cleveland he hit safely in 27 of 48 games he recorded a plate appearance, making 24 starts in left field (36 games), 13 starts in center (15 games) and 1 game in right field...Hit first career home run on August 5 at Detroit off Joakim Benoit and 2nd homer on Sept 13 at Texas off Joe Nathan...Hit .306 (22-72) during his first month of duty with Cleveland in August (11RS, .832OPS) before hitting .231 (18-78) in September...Hit in a career-high 7 straight games from Sept. 21-29 (12-for-31) before season ended after jamming his right knee on Sept. 29 vs. KC, missing the last 4 games of the season...Hit two triples on August 4 at Detroit, first Indian with two triples in a game since Josh Barfield in 2007...Played for Magallanes in the VZ Winter League in 2012 off-season, hitting .286 (32-112) with 22RS, 5 2B, 2HR & 8RBI in 30 games (8SB, .779OPS). Spent the first half of the season at AAA Columbus and the second half of the season in the big leagues with the Indians...Was with Cleveland from May 20-26 and from July 14th thru the end of the season save a one day trip to Columbus on August 19... Led all Indians minor league players with 35 steals at Columbus (45 combined on season)...Had a solid first half with AAA Columbus where he hit .287 (94-328) w/63RS, 8 doubles, 3 triples, 2 homers and 25 RBI in 82 games (.371 on-base%)...At the time of his July 14th second half recall he ranked first in the International League in runs scored (63) and steals (35 in 39 attempts/90%)... He also ranked 7th in the IL in hits (94) and tied for 10th with 39 walks...His best month came in May (.302, 29-96, 21RS, 12RBI, 23G) as he scored a combined 41 runs in 52 May/June games...On May 2 at Charlotte he went 4-for-6 w/2RS & 4RBI...First recalled to make Major League debut on May 20 and collected a game-winning, 8th inning RBI drag bunt in hisfirst-ever plate appearance off Cincinnati's Nick Masset...Optioned on May 26 after appearing in 5 games (2-8, 2RBI)...Recalled again to start the second half on July 14 and spent rest of the season with the Indians save for one day in August...From August 12 thru the end of the season he hit .258 (31-120) with 16RS, 4 2B, 3 3B, 8RBI in 37 games...Struggled some in September hitting .197 (15-76) with 2 2B & 5RBI (.514OPS)...Made 44 starts in center field (55G), 6 starts in left field (9G) and appeared in 6 games in right field (1GS)...Hit .311 (19-61) when batting 9th, ..301 (25-83) with runners on base and .362 (17-47) with RISP for the Tribe and was successful on10 of his 15 stolen base attempts (67%)...Was T15th in the AL w/7 sac bunts...Was 9th among AL rookies w/10 steals. Had spent the entire 2010 season to date at AAA Tacoma prior to being acquired for Russell Branyan, hitting .268(57-213) with 24 runs scored, 6 doubles, 2 triples and 18RBI in 64 games at the time of the trade...Was on the DL atthe time of the trade with a left hip pointer...Before being injured, Carrera was hitting .311 (19-61) with 6 runs scored,3 doubles and 6 RBI in 18 games during the month of June...Prior to the start of the 2010 season, Carrera was rankedas the 15th best prospect in the Mariners organization by Baseball America....Rehabbed at the Arizona Rookie League from July 7-14 and was activated at AAA Columbus on July 16...Hit .329(27-82) in 19 starts in the No. 2 hole in the order for Mike Sarbaugh and hit in 5 of his last 6 regular season games inSeptember (.333, 8-24, 3RS, HR, 3RBI)...Was summoned to Detroit on August 20, but not of¿ cially recalled, whenMichael Brantley twisted his ankle the night before in KC...Hit .290 (9-31) in the Triple-A Playoffs with 6RS, a HR &4RBI (3SB) in 8 IL playoff games....Hit .261 (37-142) with 26 RS, 7 2B, 12RBI & 8 SB (.371OB%) for Magallanes in theVenezuelan Winter League after the season. Named to the Topps Double-A All-Star team and was a Southern League All-Star...Among all Mariners farmhands, ranked 5th in batting average (.337) and won the SouthernLeague batting title...Named West Tenn's Most Valuable Player by the Mariners...Led the Southern League and ranked 3rd among full-season minor leaguers with a .441on-base percentage...Sidelined May 24-June 18 with right ankle sprain and again July 9-Aug. 22 with a sprainedright thumb...Recorded 25-game on-base streak, April 9-May 7, batting .356 (32x90) and walked 23times during that stretch...Played for Magallanes in the Venezuelan Winter League...hit .269 (54x201) with 8 doubles,4 triples, 1 home run, 14 RBI and 14 stolen bases...Participated in the MLB Rookie Career Development workshop in Dallas in January...Rated by Baseball America as having the best strike-zone discipline and being the fastestbaserunner in the Mariners organization. Spent season with St. Lucie where he served as the primary leadoff hitter andranked 4th in the Florida State League with 28 stolen bases...named the "best defensiveoutfielder" in the Florida State League in 2008 by Baseball America. Began season playing for the GCL Mets...recorded 20 multi-hit games, including aseason-high 4 hits, Aug. 16 at Cardinals (G#2)...promoted to Brooklyn (A) on Aug. 20,batting .300 (21x70) with 6 stolen bases in 20 games to end the season. Spent 2nd season playing in Venezuelan Summer League...hit safely in 43 of 57games, including recording a season-high 12-game hit streak (.327/16x49), July 3-14. Played in the Venezuelan Summer League, appearing in 45 games. April 13, 2019 Oklahoma City Dodgers placed OF Ezequiel Carrera on the 7-day injured list retroactive to April 11, 2019. 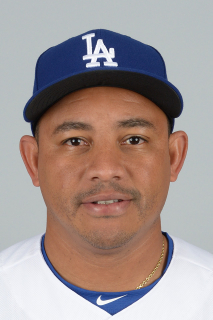 February 11, 2019 OF Ezequiel Carrera assigned to Oklahoma City Dodgers. January 29, 2019 Los Angeles Dodgers signed free agent OF Ezequiel Carrera to a minor league contract and invited him to spring training. January 12, 2019 LF Ezequiel Carrera transferred to Navegantes del Magallanes from Tigres de Aragua. November 2, 2018 CF Ezequiel Carrera elected free agency. October 23, 2018 LF Ezequiel Carrera assigned to Tigres de Aragua. September 21, 2018 Syracuse Chiefs activated CF Ezequiel Carrera. July 7, 2018 Ezequiel Carrera roster status changed by Las Vegas 51s. June 26, 2018 Las Vegas 51s activated LF Ezequiel Carrera from the 7-day disabled list. June 11, 2018 Las Vegas 51s placed LF Ezequiel Carrera on the 7-day disabled list. May 21, 2018 LF Ezequiel Carrera assigned to Las Vegas 51s. May 18, 2018 New York Mets signed free agent LF Ezequiel Carrera to a minor league contract. May 17, 2018 Gwinnett Stripers released CF Ezequiel Carrera. March 21, 2018 CF Ezequiel Carrera assigned to Gwinnett Stripers. March 12, 2018 Atlanta Braves signed free agent LF Ezequiel Carrera to a minor league contract and invited him to spring training. March 11, 2018 Toronto Blue Jays released LF Ezequiel Carrera. March 1, 2018 Toronto Blue Jays sent LF Ezequiel Carrera outright to Buffalo Bisons. March 1, 2018 Toronto Blue Jays invited non-roster LF Ezequiel Carrera to spring training. February 26, 2018 Toronto Blue Jays designated LF Ezequiel Carrera for assignment. November 7, 2017 OF Ezequiel Carrera assigned to Tigres de Aragua. June 27, 2017 Toronto Blue Jays activated LF Ezequiel Carrera from the 10-day disabled list. June 26, 2017 Toronto Blue Jays sent OF Ezequiel Carrera on a rehab assignment to Buffalo Bisons. June 14, 2017 Toronto Blue Jays placed LF Ezequiel Carrera on the 10-day disabled list. Right foot fracture. August 16, 2016 Toronto Blue Jays activated LF Ezequiel Carrera from the 15-day disabled list. August 12, 2016 Toronto Blue Jays sent OF Ezequiel Carrera on a rehab assignment to Buffalo Bisons. August 1, 2016 Toronto Blue Jays placed LF Ezequiel Carrera on the 15-day disabled list. Left Achilles tendon strain. November 28, 2015 LF Ezequiel Carrera assigned to Navegantes del Magallanes. August 18, 2015 Toronto Blue Jays selected the contract of LF Ezequiel Carrera from Buffalo Bisons. August 3, 2015 Toronto Blue Jays sent LF Ezequiel Carrera outright to Buffalo Bisons. August 1, 2015 Toronto Blue Jays designated LF Ezequiel Carrera for assignment. May 2, 2015 Toronto Blue Jays selected the contract of LF Ezequiel Carrera from Buffalo Bisons. December 3, 2014 Toronto Blue Jays signed free agent CF Ezequiel Carrera to a minor league contract and invited him to spring training. November 25, 2014 CF Ezequiel Carrera elected free agency. November 25, 2014 Detroit Tigers sent CF Ezequiel Carrera outright to Toledo Mud Hens. November 20, 2014 Detroit Tigers designated CF Ezequiel Carrera for assignment. October 7, 2014 OF Ezequiel Carrera assigned to Navegantes del Magallanes. August 1, 2014 Detroit Tigers selected the contract of CF Ezequiel Carrera from Toledo Mud Hens. May 17, 2014 Toledo Mud Hens activated CF Ezequiel Carrera from the 7-day disabled list. May 10, 2014 Toledo Mud Hens placed RF Ezequiel Carrera on the 7-day disabled list retroactive to May 8, 2014. March 29, 2014 RF Ezequiel Carrera assigned to Toledo Mud Hens. January 31, 2014 OF Ezequiel Carrera assigned to Venezuela. December 2, 2013 Detroit Tigers signed free agent RF Ezequiel Carrera to a minor league contract and invited him to spring training. November 4, 2013 OF Ezequiel Carrera elected free agency. May 7, 2013 Cleveland Indians sent OF Ezequiel Carrera outright to Columbus Clippers. May 5, 2013 Cleveland Indians designated Ezequiel Carrera for assignment. May 3, 2013 Cleveland Indians activated RF Ezequiel Carrera. May 2, 2013 Cleveland Indians claimed RF Ezequiel Carrera off waivers from Philadelphia Phillies. April 30, 2013 Philadelphia Phillies designated Ezequiel Carrera for assignment. April 2, 2013 Philadelphia Phillies claimed RF Ezequiel Carrera off waivers from Cleveland Indians. March 25, 2013 Cleveland Indians designated Ezequiel Carrera for assignment. November 15, 2012 CF Ezequiel Carrera assigned to Navegantes del Magallanes. August 3, 2012 Cleveland Indians recalled Ezequiel Carrera from Columbus Clippers. August 3, 2012 Ezequiel Carrera roster status changed by Cleveland Indians. August 3, 2012 Cleveland Indians activated LF Ezequiel Carrera. March 18, 2012 Cleveland Indians optioned Ezequiel Carrera to Columbus Clippers. August 20, 2011 Cleveland Indians recalled Ezequiel Carrera from Columbus Clippers. August 19, 2011 Cleveland Indians optioned CF Ezequiel Carrera to Columbus Clippers. July 14, 2011 Cleveland Indians recalled Ezequiel Carrera from Columbus Clippers. May 26, 2011 Cleveland Indians optioned Ezequiel Carrera to Columbus Clippers. May 20, 2011 Cleveland Indians recalled Ezequiel Carrera from Columbus Clippers. March 25, 2011 Cleveland Indians optioned Ezequiel Carrera to Columbus Clippers. October 13, 2010 Ezequiel Carrera roster status changed by Cleveland Indians. August 5, 2010 Ezequiel Carrera roster status changed by Columbus Clippers. July 29, 2010 Columbus Clippers placed CF Ezequiel Carrera on the 7-day disabled list. July 15, 2010 Columbus Clippers activated CF Ezequiel Carrera. July 7, 2010 sent CF Ezequiel Carrera on a rehab assignment to AZL Indians. June 28, 2010 Cleveland Indians optioned CF Ezequiel Carrera to Columbus Clippers. June 27, 2010 Cleveland Indians Traded 1B Russell Branyan to Seattle Mariners; High Desert Mavericks Traded SS Juan Diaz to Kinston Indians and Seattle Mariners Traded CF Ezequiel Carrera to Cleveland Indians. June 21, 2010 Tacoma Rainiers placed CF Ezequiel Carrera on the 7-day disabled list. March 16, 2010 Seattle Mariners optioned CF Ezequiel Carrera to Tacoma Rainiers. November 20, 2009 Seattle Mariners selected the contract of Ezequiel Carrera from West Tenn Diamond Jaxx. October 7, 2009 OF Ezequiel Carrera assigned to Navegantes del Magallanes. August 1, 2009 OF Ezequiel Carrera assigned to High Desert Mavericks from West Tenn Diamond Jaxx. August 1, 2009 Ezequiel Carrera roster status changed by West Tenn Diamond Jaxx. June 18, 2009 West Tenn Diamond Jaxx activated OF Ezequiel Carrera from the 7-day disabled list. May 26, 2009 West Tenn Diamond Jaxx placed CF Ezequiel Carrera on the 7-day disabled list retroactive to May 24, 2009. Sprained right ankle. April 4, 2005 New York Mets signed free agent OF Ezequiel Carrera to a minor league contract.